Cody Jordan admits she can't draw, but she can envision and present her ideas to those who can draw and paint – especially on much larger scales then a regular piece of paper or canvas. A Travis Elementary School music and drama teacher by trade, Cody (pictured above right) since last fall has taken on the role of coordinating the beautiful and thought-provoking downtown murals springing up on the sides of many buildings. 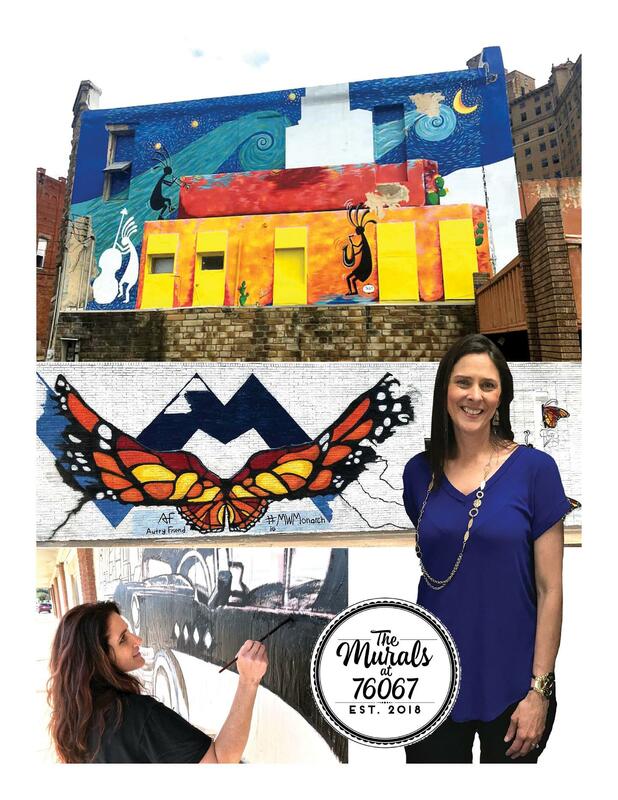 She, along with the talented muralists, have dedicated hours and hours of research, labor and effort – and much of their own money – in helping bring downtown Mineral Wells back to life by covering up old and ugly buildings and giving them a new look, new life and new hope. Anyone who has been downtown has seen them. A monarch butterfly with wings spread like those of an angel, forming the "W" along with a mountainous "M" over it for Mineral Wells. A female "pouring her heart out" as she springs from the sprout of a water can. Historic cars depicting decades of Mineral Wells history. The hope that is seen in the 1920s flapper blowing white leaves from a dandelion – and much more. 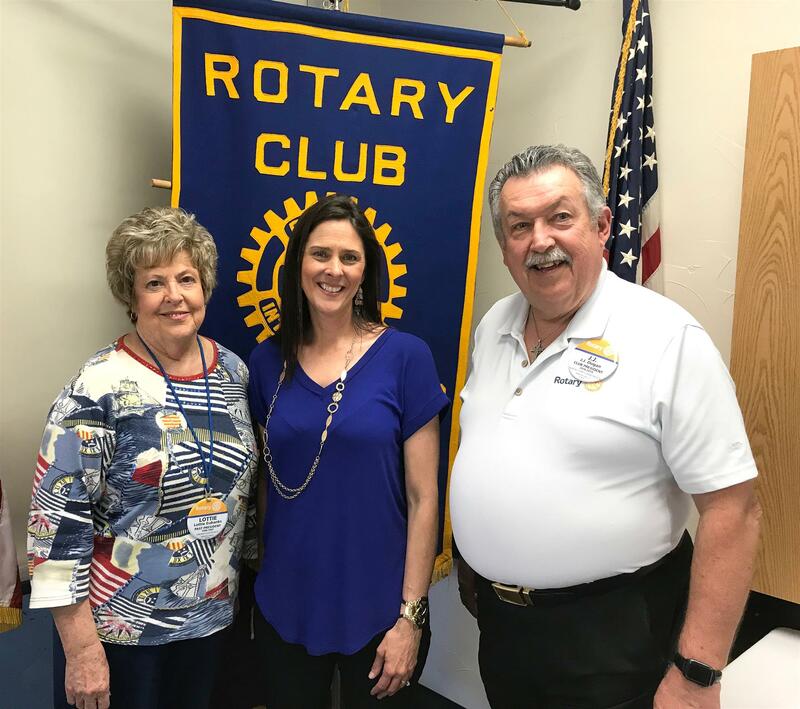 "Every mural has a story behind it," she told Mineral Wells Rotary Club members attending Wednesday's weekly meeting at Palo Pinto General Hospital. Hoping to put negativity in the past, the murals are intended to cast an air of positivity throughout the town and help draw people to the city's central business district as it remakes and new stores and restaurants open, all ahead of what could be a downtown park and other features. "People are drawn to downtown today," said Cody. "People don't really shop in malls any more. They want to go downtown." With so many people using varies social media platforms, Cody and the artists believe many will take selfies and photos in front of the murals, or simply photograph the artwork, and share them with their connected friends and followers. A future interactive murals tour using a smartphone app is planned. Cody said the downtown murals represent Phase I of the overall artistic endeavor. Phase II will take on murals projects just south of downtown in the Dunbar area that will be more kid-themed. She is thinking ahead about Phase III that she hopes will involve statues placed in the town's center – a potentially expensive project. She said is working with a college arts professor on potentially securing grants to help with the costs. None of this is cheap. Cody said she and the artists have paid for supplies out of their own pockets – the murals can cost $500 each and more depending on the work needed. People interested in donating to the project can do so through Envision Mineral Wells at the Mineral Wells Area Chamber of Commerce. Call 940-325-2557 for more information about getting involved and supporting the project. More information on the murals, the artists and the stories behind their creations can be found on Facebook at "The Murals at 76067." Cody said while some of the murals tie into local history – like the classic cars on the sides of the Seaman building or the Loving-Goodnight-themed double-wall mural on the open corner next to the former Spears store, she said many of the murals are intended to be more modern and attract visitors to town, to speak to them in ways that historical depictions might not. She said she essentially gives artists a theme for a building then lets their creativity and imaginations run wild. She said many of the murals will be temporary and replaced with others over time, though some will stay. She said a problem they have encountered is the level of alkalinity in older bricks that will cause some of the murals to quickly deteriorate in the weather. In some cases, the buildings and wooden window coverings are so old the require multiple layers of base paint before the artist can begin creating. She said the project has brought together artists of all ages working alone, or in groups. Cody said an 87-year-old woman in Strawn has drawn a mural idea on paper to show log cabins of the pioneer and settlement days. While she can't paint it onto the side of a downtown building, artists are going to collaborate with her and bring her idea to life. Cody said the inspiration for the wall murals came from the work artists and downtown business and property owners Perri Leavelle and Regan Johnson did in the last few years restoring a Coca-Cola advertisement on the side of a building and then restoring the Bull Durham tobacco wall ad uncovered during a building's renovation. Perri and Reagan also created the flapper mural on the front of the former Ritz Theater building from an idea coming from another downtown business owner, Shaley Cates. The murals and downtown artworks will be an ongoing process for years to come. Rotary Club of Mineral Wells meets every Wednesday at noon at Palo Pinto General Hospital for lunch, networking, updates on club news and projects, and a program of interest. Meetings are intended for members, invited guests and prospective members.